At Hardenhuish School, we want our young people to have every opportunity to fulfil their future career aspirations. 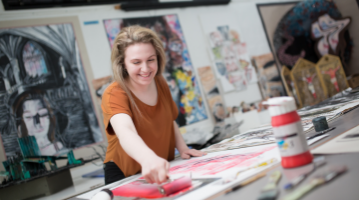 Therefore, we believe it is of paramount importance for pupils to make informed choices about their next steps when they make choices at 16 or after sixth form at 18. To this end, our young people need to have a secure knowledge about their future education, training and employment opportunities together with high quality and impartial advice and guidance to support their progression beyond Hardenhuish. Preparing pupils for the world of work and helping with their employability is a key priority for us and we are committed to providing a planned programme of careers education, information, advice and guidance for all students in Years 7-13. This will include personal guidance, careers focussed SMSCE lessons, curriculum opportunities, work experience, visits to Colleges and Universities, talks by employers, apprenticeship providers and Universities, careers fairs, employability workshops and other career related events. The school recognises the importance of careers education and work-related learning as demonstrated in the appointment of a Careers and Transition Manager and fully qualified Level 6 Careers Adviser, Vicky Brenton. Guidance meetings with Mrs Brenton are provided for Year 11 pupils; with lunchtime drop-in sessions and appointments being available to all year groups. They are also provided for pupils if suggested that this would be helpful by tutors, Learning Managers and the SENCO. Mrs Brenton provides impartial and personalised information, advice and guidance, about the range of education and training options that are most likely to help our students achieve their ambitions. 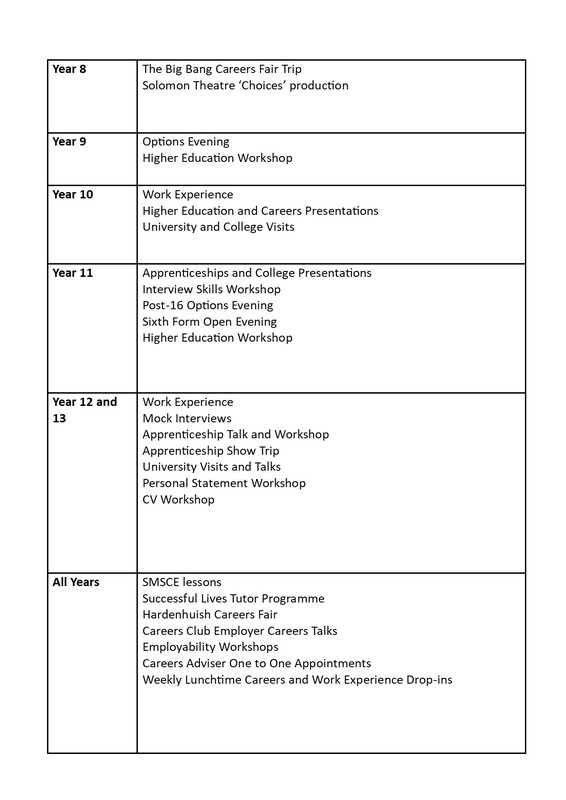 Pupils can discuss choosing a career, apprenticeships, University or College courses, A-level choices, work experience and get help with applications, CVs and interviews. Pupils can ask their tutor to book them an appointment or go to the careers office in E centre or attend a lunchtime drop-in session. During tutor mentoring sessions, tutors also give advice regarding post 16/18 opportunities based on the pupil’s interests, skills and abilities. Careers education forms an important part of the Key Stage 3 and 4 Spiritual, Moral, Social and Cultural Education (SMSCE) programme and the Successful Lives tutor led programme. This is supplemented by additional career and employability related workshops and talks at lunchtime, after school and on cross-curricular days. Staff are also encouraged across the curriculum to explain the links between subject content and vocational learning whenever relevant. Good quality careers resources are available to all pupils via the school website, library, careers office in E centre, sixth form study room, poster and leaflet displays. This includes resources about apprenticeships, university courses, gap years and job profiles. The school has subscribed to careers websites called Careerpilot and E-clips, available on the School’s computer network, to help students decide on and research careers and the qualifications needed for them. Please see ‘Career Research Websites’ below for links to these and other useful websites. The National Careers Service also has a dedicated phone line for free career advice: 0800 100900. As a school, we are registered with Morrisby, and can offer students the opportunity to access a Morrisby career profile assessment for a reduced price of £25. Please contact Vicky Brenton (vjb@hardenhuish.wilts.sch.uk) for further information about this. 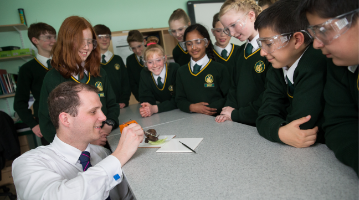 As a school, we endeavour to facilitate as many pupil/ employer encounters as possible. As such, the school is part of the Careers and Enterprise Company Network and we are working closely with our Enterprise Adviser from Ixys. We also have good links with many other local employers, independent advice services and apprenticeship providers. We arrange regular lunchtime and after school careers talks and employability workshops through our ‘Hardenhuish Careers Club’. These are available to all year groups and are delivered by a variety of employers and providers. Mock interviews are also held with the help of employers for Year 12 and 13. We feel strongly that all pupils should have first-hand experiences of the workplace to help their exploration of career opportunities and expand their networks. Therefore, all pupils are given the opportunity to do one week of work experience towards the end of Year 10 and again in Year 12. Pupils taking the Vocational Studies course also have one day a week work experience in Year 11. Other opportunities for visits to local employers and work places are made available for groups of pupils through curriculum areas where possible. Recent visits have included Good Energy and Siemens in Chippenham. The annual Hardenhuish Careers Fair provides the opportunity for all pupils to engage with approximately 40 employers, education and apprenticeship providers and receive impartial and independent careers information, advice and guidance. Year 12 and 13 can also visit the National Apprenticeship Show, with over 60 employers and providers showcasing opportunities. Curriculum areas regularly arrange talks from employers and take pupils on visits to careers events such as the Big Bang careers fair trip for Year 8 and the Festival of Engineering. The school has strong links with Universities, Further Education and Apprenticeship providers. We also work closely with the Wessex Inspiration Network (WIN) to ensure that all our pupils are well informed and encouraged to progress into higher education. Wiltshire College visits the school as part of the KS4 SMSCE programme and provides information about opportunities in Chippenham, Lackham and Trowbridge for pupils interested in level 1-3 vocational courses and apprenticeships. Selected pupils in Year 10 will also visit Wiltshire College and/ or Bath University for a taster day. Other guest speakers visit to provide information and guidance to those Year 11 pupils considering apprenticeships. Information about applying to higher education through the Universities and Colleges Admissions Service (UCAS) is provided through a series of sessions delivered by the Sixth Form Learning Manager to Y12 and Y13 during sixth form core time. Further one to one advice and support, for example in writing a personal statement for UCAS, is provided to students by the sixth form tutors and the careers adviser. Other events in the sixth form include a personal statement workshop facilitated by the University of Bath, University visits and talks by Universities and other external speakers about student life, student finance and studying abroad. www.eclips-online.co.uk – This contains really useful information leaflets about every career. To access the website at home, use the school password: SN14 6RJ (school postcode with a space). www.careerpilot.org.uk – This is a great website giving lots of information about all the different options available for future work and study in the South West. www.nationalcareersservice.direct.gov.uk – This has useful tools that will help you to choose a career and give you career suggestions and create a CV. You can also talk to an adviser for free on 0800 100900.
www.icould.com – This is a great website for exploring different careers by watching films about what it’s like to work in a wide variety of jobs. www.sacu-student.com – A visual quiz that matches you to HE courses, careers and apprenticeships. www.ratemyapprenticeship.co.uk – Search for apprenticeships, traineeships, internships, work experience and jobs. www.getingofar.gov.uk – The National Apprenticeship Service website. It provides one-stop information about apprenticeships including apprenticeship vacancies. www.notgoingtouni.co.uk – This provides information on the opportunities available after school – for training, employment, sponsored degrees, etc. www.reed.co.uk – create a CV and find jobs. www.ucas.com – UCAS is the organisation responsible for managing applications to higher education courses in the UK. Not only do UCAS process more than two million applications for full-time undergraduate courses every year, but they also help students to find the right course. www.prospects.ac.uk – This is all about graduate jobs and is the UK’s leading provider of information, advice and opportunities to students and graduates. You can see what jobs different degree subjects can lead to and search actual graduate vacancies. www.ukcoursefinder.com – This is a good site to look at if you have no idea what you might like to study. It has a subject’s interest questionnaire which provides degree subject suggestions based on your answers. www.university.which.co.uk – The Which? University guide has lots of information and filters to help you find a course to suit your needs. www.theguardian.com/education/universityguide – The Guardian University Guide has information on every subject taught at universities in the UK ranked in league tables, also has subject profile information. www.thecompleteuniversityguide.co.uk/league-tables – university league tables. www.whatuni.com – A good site for comparing University courses and ordering prospectuses. www.thescholarshiphub.org.uk – Search for University scholarships, grants and bursaries. www.opendays.com – details of university open days. www.gapyear.com – information and advice about gap years. www.campamerica.co.uk – job opportunities in America – temporary and summer jobs.